With the US paying more attention to energy usage, it was only a matter of time before this greening trend affected Christmas tree lighting. 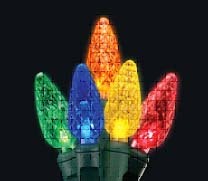 This year we expect to continue to see a rise in sales of the more efficient LED light strings. In fact when queried about Christmas tree lighting, Costco buyer Lester Cox responded, “It’s obvious that LED is the wave of the lighting future”. Consuming 75% less energy than their incandescent counter parts, these light emitting diode (LED) bulbs are an efficient way to handle holiday lighting. In fact according to a source at GE, a total market shift to LED holiday lights could save the electrical equivalent of the power used by almost 500,000 households. Of course, energy efficiency is not the only reason the market is moving to these new bulbs. Since the new LED bulbs generate less heat than conventional bulbs, they are not only less costly to operate but safer to use. In addition, LED bulbs are reported to last up to 10 times longer than regular incandescent Christmas bulbs. C9 LED Bulbs are the bulb of choice for outdoor Christmas tree lighting projects. These bulbs are larger and thus more visible from a distance. They’re also insulated and can stand up to the extremes of outdoor weather. For indoor Christmas tree lighting, consider the sweet, little nostalgic looking C6 LED bulbs. Reminiscent of the little lights used in the 1940’s, these LED’s now feature diamond etching. Unlike the bulbs of yesteryear, these bulbs stay lit–even when one burns out. Currently, these are the selections available, but as Christmas nears more styles of LED Christmas lights are sure to arrive at your local retailer.